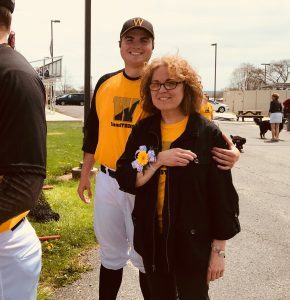 I am standing with my mom as we wait to take part in the 2018 College of Wooster Baseball Senior Day! It has been a long journey up until this day and I could not have been happier to be along side my mom! My mom and I are wearing our team’s SamStrong shirt which honors and supports current COW senior Sam Severance as he navigates a difficult time in his life. I chose to wear black high socks with my white pants as I have always done so since I have arrived at Wooster 4 years ago.